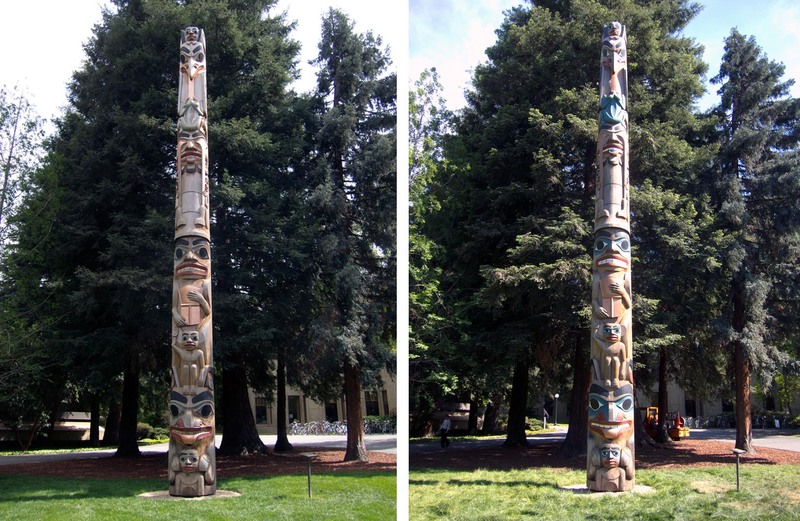 Stanford’s campus and the Cantor Arts Center is fortunate to have two totem poles in our collection carved and painted by prominent totem pole artists of the Pacific North West. Boo-Qwilla by Art Thompson was installed in Dohrmann Grove in 1995 and Stanford Legacy by Don Yeomans was installed in Canfield Court in 2002. Recently these poles underwent an extensive preservation and restoration effort. 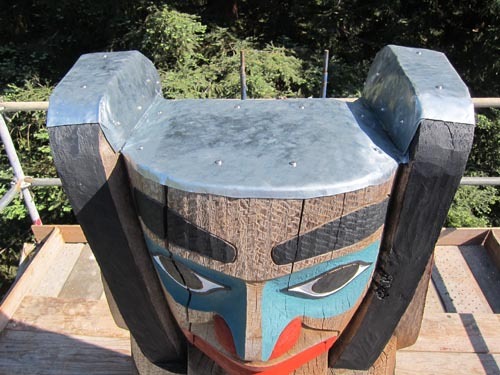 One of the most basic needs of an outdoor work of art, like Stanford’s totem poles, is preventative maintenance in order to keep the sculpture looking its best, and even more importantly to maintain its structural integrity and overall condition. The objective of this re-painting and preservation project was to clean the poles and restore them as closely as possible to their original appearance and the artist’s intent, and, to combat factors that could contribute to their deterioration. Before any work was considered, the artists and their estates were consulted and artists John Livingston and his wife Maxine Matilpi were chosen to carry out the re-painting of the poles. The Native American Gallery of the Cantor Arts Center of Stanford University displays several of John Livingston’s carved and painted wood artworks and a beaded textile by Maxine Matilpi. Livingston has a long-standing relationship with both of the totem poles artists. He had worked closely with Art Thompson during his career, and served as assistant carver to Don Yeomans during the creation of the Stanford Legacy pole. More information about their work can be found in these short videos of John Livingston and Maxine Matilpi in the Native American Artist Series, produced by the Quintana Galleries. 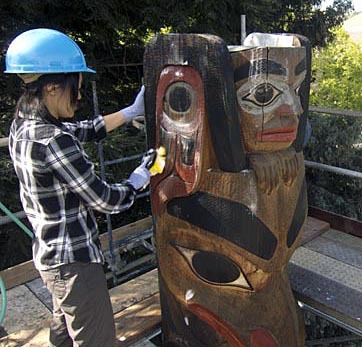 A professional conservator with an expertise in totem pole conservation was consulted before any intervention. Andrew Todd visited to inspect the poles and weigh in on the current condition of each, in order to provide treatment recommendations based on his experience treating totems and museum background. Andrew lives and works in Canada, where totem poles are abundant, and travels the world to treat totem poles in situ. For more information on his practice visit the AT Conservators website. The first stage of the treatment was a thorough cleaning. The poles were washed with a mild detergent and soft bristle brushes to remove any dirt or bio-growth in preparation for a fresh coat of paint. Before the painting could be done an additional application of wood preservative was necessary to deter wood boring insects. 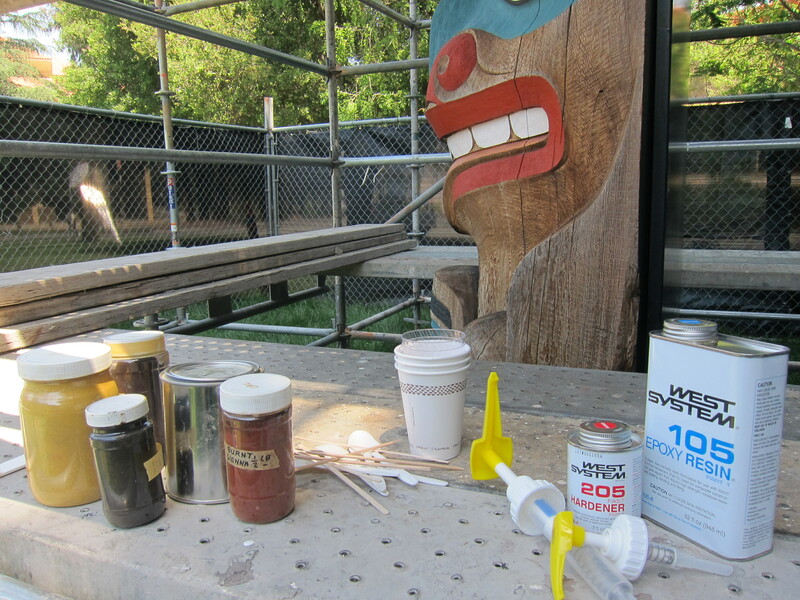 Both of the totems had previously been treated in this manner, however because the preservative is water-soluble, washing the poles may have removed some of the previous application. To ensure the wood was protected a 10% solution of Timbore, a borate-based wood preservative, was applied to the poles using a garden sprayer. The application was focused on the end-grain where the wood is most absorbent, allowing capillary action to carry the solution throughout the totem pole and disperse the protection. Once the poles were clean and treated with a preservative the painting could begin. 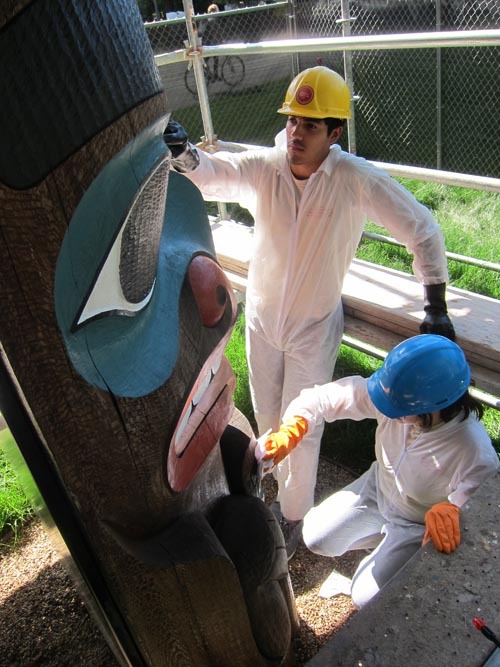 Totem pole artists John Livingston and Maxine Matilpi traveled from Victoria, Canada to carry out this important work. Good conservation practice makes every effort to maintain a connection with living artists, and in the case of totems, Livingston and Matilpi were an essential part of the project. The intention of this project was to maintain the cultural integrity of the totem poles, while providing materials that will prolong the life of the artwork. Much effort was put into identifying paints to replace the original paint formulas, which are no longer manufactured in compliance with current California V.O.C (volatile organic compounds) laws. Livingston and Matilpi used exterior grade acrylic paints approved by each artist’s estate, which were selected based on their similarity to the original artist-applied paint and proven exterior durability. A protective coating was applied after the painting was complete. A handmade coating developed by the US Forest Service was chosen from a variety of available wood sealants because it was developed specifically for the protective coating of totems, and has proven successful in many case studies after years of exposure to the elements. The coating was mixed just before application and applied with a hand sprayer to the surface of the poles. The coating was carefully wiped from the painted areas to avoid creating an uncharacteristically glossy surface over the matte paint, where it could not be as effectively absorbed into the wood grain as on the unpainted surface. A few areas of Stanford Legacy required more attention after painting and coating were complete. The proper left side of the figure holding a shield had a previous repair/fill that had deteriorated. This fill was carefully removed with chisels and a hammer. A new fill was created using epoxy bulked with sawdust and tinted with dry pigments to match the surrounding wood. A few areas of delaminated and detached wood were adhered in their original positions using epoxy and clamping pressure from a nylon ratchet strap around the circumference of the pole (protecting the wood and paint from pressure and abrasion with a Mylar and cotton towel barrier). Lastly, a new zinc cap was made to fit the top of Stanford Legacy. These types of caps are made for totem poles to protect against direct water penetration of the end-grain, and also because certain metals, such as zinc, provide ionic protection. As the zinc corrodes over time the ions released act as a biocide, preventing the growth of small organisms that can be destructive to the wood. Not too long ago Boo-Qwilla received a similar treatment and was given a lead cap because lead ions possess similar biocide properties. This is great! I’m going to post Kurt Hickman’s video and totem story on the arts website next week. Can I link to this as well? Also, I’m looking for a horizontal hi-res image for the website. The before and after shots of the top of Legacy might work nicely if I can sew them together. Will you send me the files and a photo credit? Thanks. Thanks Robin! I will send you the images shortly. I’ve added a link to Stanford News to our post.